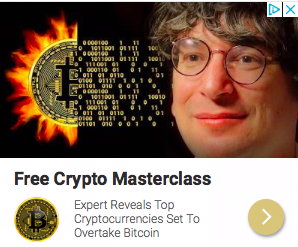 If you get the same web ads that I do, you’ve seen this ad of this picture of a Bill Gates look alike promising to sell the secrets of Bitcoin trading. Apparently, this guy has made so much money trading bitcoin that he has to take a side gig of selling bitcoin ads. While I won’t pay money for secret bitcoin strategies, I have signed up for some free spam bitcoin trading guides. So simple! Anyone can be a crypto-millionaire. Most of my investing is done with boring index funds and a few mutual funds. But I’ve found some similarities in stock market investing that carry over to cryptoinvesting. …buy and hold is still your best bet. Investopedia says, “In a typical six-month period more than 80 percent of day traders lost money, and only 1 percent of them could be called predictably profitable.” I suspect that crypto day traders likely face the same fate. Don’t try to time the market. I don’t think holding a coin long-term necessarily means holding on to it for over a year, but hold it long enough to see if the coin can survive a few drops in the market which inevitably happen. …you need to do research and understand the fundamentals of the coins you want to invest in. Who are the teams leading the development of the coins? What partnerships do they have? What problem are they trying to solve? While some altcoins are scams, a lot of them are startups trying to use blockchain technology to solve a real world problem. … you need to diversify. Don’t put all your money into the latest and greatest coin that went up 100% last week. Spread your investments across several coins. At the same time, don’t over-diversify into so many coins that you can’t keep track of them. Just like with stocks, you should keep tabs on the news for your coin. What are any new developments with your coin? Did China ban my coin? … cryptomarkets are open 24/7. Bitcoin doesn’t take holidays, doesn’t sleep, doesn’t break for dinner. I think this contributes to the hype because there is no downtime. What better way to start your morning than finding out that your coin went up (or down) 50% over night! … cryptomarkets are global. If I wanted to invest in a Hong Kong stock I’d have to open an account with a stock exchange in Asia, which would likely require an address and a Hong Kong dollar bank account there. Cryptomarkets have a much lower barrier to entry (for now). So I’m trading with people all over the world. This means that I have to stay on top of the global news a lot more closely. For example, when South Korea talks about increasing bitcoin regulations, that directly can cause the bitcoin price to drop. … 90% of altcoins might be at best good idea that fail anyways, or at worst scams. Imagine if every publicly listed companies were high-risk startups. You might hit the next Facebook, or you might end up with Friendster. This is a reminder to not invest more than you can afford to lose! .. and if you haven’t noticed already, cryptomarkets are like the stock market on steroids. In the last 24 hours as I type this, the price of Bitcoin has dropped 18%. If the stock market dropped that much in once day, it would qualify as the second largest percentage drop ever. (The biggest single day percentage drop for the stock market goes to Black Monday at 22%. Here in crypto-land it’s just a regular Monday). Bitcoin, where the journey is just as important as the destination! In conclusion, while crypto-markets are extremely young and unpredictable, I think it is still possible to invest (relatively) wisely and strategically. As I continue to formulate my own investment strategies, I’ll keep posting them.